Join us on Saturday, March 21st for our annual meeting. Jason W. Brown, a former center with the National Football League (NFL) will address the group on his transition from football to farming. Check out the press release for more information. American Agri-Women is the nation’s largest coalition of farm, ranch and agribusiness women with more than 50 state, commodity and agribusiness affiliate organizations throughout the country. 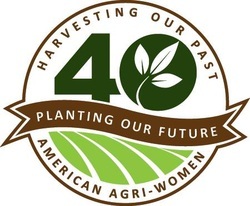 AAW members have been advocating for agriculture since 1974 and are now celebrating their 40th anniversary. National Ag Day was established in 1973 to recognize and celebrate the abundance provided by agriculture in our country. As the world population soars, there is even greater demand for the food, fiber and renewable resources produced in the United States. As members of North Carolina Agri-Women, you ladies play an instrumental part in this process. A few generations ago, most Americans were directly involved in—or had relatives or friends involved in—agricultural-related endeavors. Today, that is no longer the case. That is why it is so important that we join together at the community level..our voices, in concert, become a shout that carries our message a great deal further than any one of us can do alone! NC Agri-Women is unique in that we represent women involved in every segment of the North Carolina food, fiber, and bio-fuel industry...no matter the type, size, or location within the state. NCAW represents both organic and non-organic food production, both traditional and sustainable, urban and rural agriculture...we are the unifying voice of agriculture in North Carolina! As we conclude Ag Day 2014, please accept my sincere appreciation for all that you do to support and promote agricultural production in our state. As daughters, wives, sisters, and mothers, you ladies are changing the face of North Carolina agriculture and are blazing a trail for future generations of women. I am honored to partner with you in this endeavor, and I watch in admiration as you ladies not only feed the world, but also transform it! Please join us in welcoming Stacy Sink as the new North Carolina Agri-Women Treasurer! This position was previously held by Toni Swaim who recently accepted the position of NCAW President-Elect. We continue to seek individuals willing to serve in the roles of Public Relations and District Delegates. Contact NCAW to learn more or to submit your nomination. North Carolina Agri-Women was officially chartered this past August under the leadership of our president, Ms. Jesse Scott. As an avid outdoorswoman and a vocal supporter of North Carolina agriculture, Jesse has led North Carolina Agri-Women with enthusiasm and represented us well at the National Agri-Women Conference in Canada this past fall. However, much to our sadness, Jesse recently accepted a position in Montana and will be resigning her role as President of North Carolina Agri-Women effective January 18. After examining our bylaws, the NCAW Board determined that the President-Elect (Amy Robinette) will assume the duties of the President for the remainder of the year and will lead NCAW through the upcoming 2015 term. The Board has decided to open the floor for nominations for the vacant position of President-Elect. Qualified applicants in good membership standing should submit their interest for this position to Amy Robinette at NCAgriWomen@gmail.com by February 1 for consideration. While change is never easy, we are excited for the new opportunities this brings to Jesse and to NCAW. Jesse Scott was instrumental in establishing our North Carolina Agri-Women organization, and we hope that you will join us in wishing her much success as she embarks on this new adventure!